We are small family owned buisness in Grandview, Texas which is about 45 minutes south of Ft. Worth/Dallas. We sell utility trailers in various sizes/styles ranging from 4x8 standard utility trailer to 102x40 gooseneck trailers. Our company is also able to do custom made trailers like shade trailers and landscape trailers. 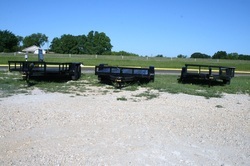 We also carry super duty trailers. We are able to make inclosed trailers for Oil Field and Gas Industries which are commonly called 365 deluxe trailers, as well as restroom trailers andshowertrailers. Upgrades include Generator, Cabinets and Emergency Eye Wash and/or Shower Stations.